I've never used a nail polish thinner before and hadn't thought of buying one until recently. I just used to throw out polishes once they went horrible and repurchased if I liked the colour enough. Now though I have a lot more polishes so it means I don't use each one that often. They tend to go gloopy more quickly now so instead of throwing them out and wasting a lot of money I bought a thinner. As I said I've never used one before so I have no idea which is the best, should I go for cheap or expensive? In the end I went with one from Mavala as it was only £5.40 on FeelUnique which seemed a pretty decent price. Although OPI's is a better deal, 60ml seems a lot of product when you only need a couple of drops per polish. If I ever run out of this one I'll think about getting the OPI one. You simply take an old gloopy polish and add a couple of drops of thinner, give it a good shake and leave to settle for about 20 mins. It works wonders for a gloopy polishes and even those that are just a tiny bit too thick, one drop will make it easier to apply. If the nail polish has gone completely sold then I don't think even this can solve the problem but for a gloopy polish it's a must. 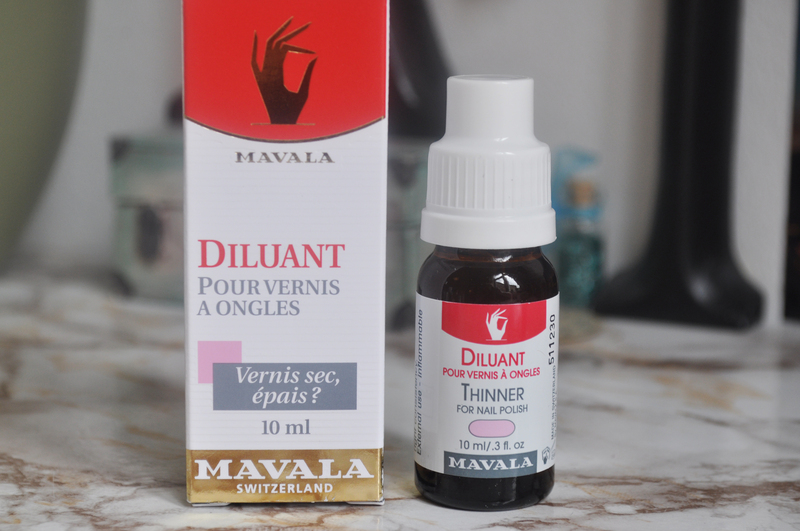 Have you used a nail polish thinner before? seems like a great products,never used it!